To try and put a date on the introduction of Harpastum is hard but we can consider that the Romans conquered Greece in 146 BCE so it is fair to estimate that the Romans discovered the Greek versions of the games shortly after th at date. Harpastum was still a rugby style game (you could use your hands and feet) and was used by Julius Caesar and his generals as a form of military training to improve the physical fitness of the Roman Army. Harpastum was known as the Small Ball Game. 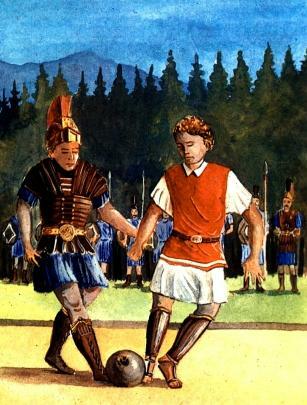 This is due to the fact that the other ball games played by Romans had much larger balls. The Harpastum ball was made from a stitched leather skin and stuffed with chopped sponges or animal fur. The ball was approximately 8 inches in diameter. Little is known of the exact rules of the game but we do know that the pitch was rectangular and just a little smaller than an average sized football pitch today. The number of players varied from game to game – some reports suggest games with hundreds of players on each side. The game bore striking similarities to rugby and the players had to get the ball over the opposing line to ‘score’. Harpastum was an incredibly fast and physical game – it was also quite violent and tackling was allowed. Due to the nature of the game, Harpastum was only played on grass or dirt since players were expected to end up on the floor!!! Due to the might of the Roman Army and their huge expansion plans, Harpastum travelled with their armies to most European countries where it proved quite popular with the local populations in almost all cases. Hence it is the Romans who are responsible for delivering football to other countries and territories around the world. In particular to Britain where the game developed into the game it is now.